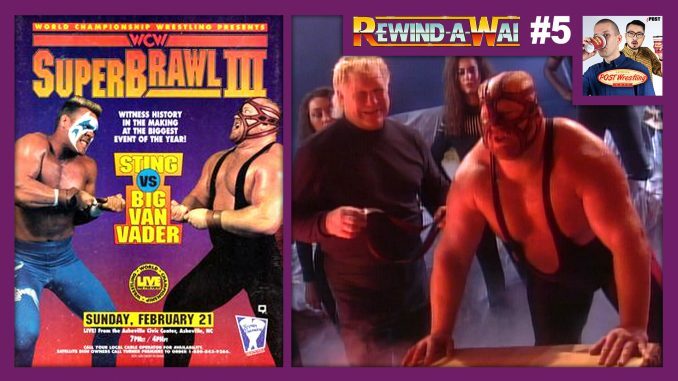 John Pollock and Wai Ting return for another edition of Rewind-A-Wai and travel (by helicopter) to the year 1993 to review WCW's SuperBrawl III card featuring the "White Castle of Fear Strap Match" between Big Van Vader and Sting. The fifth edition of REWIND-A-WAI is now available for all POST Wrestling Café patrons – go to Patreon.com/POSTwrestling to download OR check your podcast app if you have subscribed to the RSS feed provided to all members. John Pollock and Wai Ting return for another edition of Rewind-A-Wai and travel (by helicopter) to the year 1993 to review WCW’s SuperBrawl III card featuring the “White Castle of Fear Strap Match” between Big Van Vader and Sting. This edition of the show is presented by our “Espresso Executive Producer” Ryan Charkow, who will join us to discuss why he chose this specific event, his 10th birthday party viewing of SuperBrawl, and growing up watching WCW in Canada. February of 1993 was one of the craziest time periods in WCW’s history with the exit of Bill Watts, the promotion of Ole Anderson, Ric Flair’s return, Jim Ross’ removal from WCW programming, The British Bulldog’s debut and Eric Bischoff beginning his ascent within Turner Broadcasting.